Discussion in 'Canon InkJet Printers' started by Lia, Sep 7, 2018. I own my Pro 10 about 2 years now and I use it mainly to print graphics on matte uncoated papers. Recently, When sending an image with a solid color Cyan'ish background it prints darker at the beginning of the image and gradually becomes brighter. I had already printed many copies of the same image file, print settings & paper and just recently encountered this issue. I did a nozzle check followed by a printhead alignment & everything looks fine, no visible clogs or issues. Has anyone of you encountered the same problem and have an idea how to solve it? When sending an image with a solid color Cyan'ish background it prints darker at the beginning of the image and gradually becomes brighter. I can see some darker Cyan along the right hand border of the printed image. Is this the issue? Not sure what you mean about "sending" (WiFi? ), but I suppose you want the Cyan color to be uniform. Which shade of Cyan is abnormal - the lighter or the darker? Does this happen with a different type of paper is used to print? Do you use new cartridges only - no refilling? If you refill your cartridges, what ink do you use? What cartridges do you use - OEM Canon or aftermarket cartridges? Please post a cropped image of your nozzle check. As I understand the print is darker while printing the first lines and not at the right border of every line (the print you show has been started to print from the right side ?). Is the paper flat ? There is a setting to change the distance of the printhead to the paper. By "sending" I meant printing straight from the computer via USB. The desired shade is somewhere between the lighter & the darker. I haven't tried printing it on a different paper, however, I did try to print a layout of 4 x A5 copies on 1 sheet and a darker cyan horizontal border appears along each of them, not just along the edge of the paper, so I don't think It a paper issue. And as I mentioned, it used to print just fine, until recently. I use PC refill inks by topping the same set of OEM cartridges I bought a while back. You understood correctly. The print is darker while printing the first lines of the image, not just along the edge of the sheet. As I replied to Stratman, I did try to print a layout of 4 x A5 copies on 1 sheet and a darker cyan appeared along the right border in each of them, not just along the edge of the paper, so It doesn't seem to be paper related. By distance setting you mean the "prevent paper abrasion" checkbox, I assume, but the thing is, that the lighter Cyan being printed isn't correct, it's lighter than my former prints. It looks like something got out of balance. Maybe it's the ink or the cartridges, but if that was the case, wouldn't it be visible the Nozzle Check? Your Magenta and Photo Magenta look very similar. Is that my eyes or do you see it as well looking at the printed page? Yes, I see it too, both pigments looked similar in all nozzle checks that I can remember. Have you used PC72 inks? I have not yet witnessed other users results. But even if that will turn out to be a problem in need of fixing, it doesn't explain the printed gradient. As far as my eyes can tell, I believe my nozzle check looks as it should, doesn't it? It's a nozzle check of the Pro9500 but in this example, the M and PM look very similar. 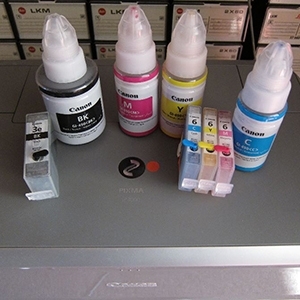 Have you used PC72 inks? I used the same or similar image from my Google search to compare with your nozzle check. The M and PM look qualitatively different to me. Different printer so maybe different ink sets? The lighting/contrast and selection of other colors next to the P and PM can affect one's perception of color as well. See this TED Talk. doesn't explain the printed gradient. No it does not. Given the information you have provided so far, this is either hardware, software or user error. - did you alter any software settings either in the Operating System, printer, print application, or application used to create and save the image? - if the image was created from a scan, is it possible the scanner is malfunctioning in some fashion? Based on your trial of printing 4 x A5 copies on 1 sheet it seems less likely this is a paper or ink starvation issue as long as the smaller image display identical proportional alteration in color gradient as your original full size print. 1) Try a different application to print. 2) Try a different printer driver. Use a different paper type to match the driver setting as needed. 3) Make sure settings are at default for printing, at least initially. 4) Recreate a new version of the desired image. Do not keep using the same image file to print.